Kabul’s China-policy will not alter, irrespective of the political situation, said Afghan President Hamid Karzai on Saturday. 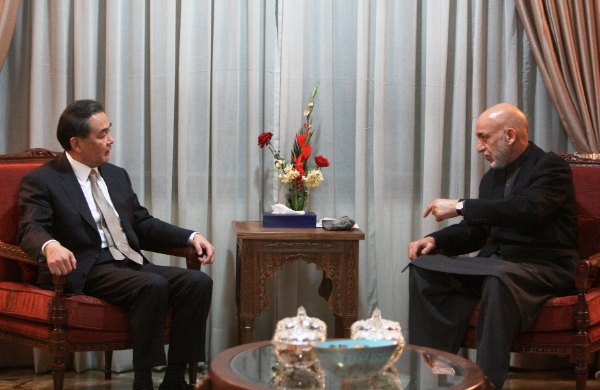 Karzai was hosting Chinese Foreign Minister Wang Yi who arrived in Afghanistan on Saturday. Wang said he made the visit in the crucial year of Afghanistan’s transition to underscore the importance of bilateral ties. “We hope to see a broad-based and inclusive political reconciliation in Afghanistan as soon as possible, and China will play a constructive role to facilitate that,” he said. “China firmly supports Afghanistan to realize a smooth transition and hopes Afghanistan’s general election will go ahead smoothly as scheduled. China is willing to keep close communication with Afghanistan and work hard to facilitate Afghanistan’s political reconciliation,” he added. The Afghan government is trying to reassure foreign investors its economy will not sink following the NATO withdrawal. In their meeting on the sidelines of the Sochi opening in Russia earlier this year, Karzai asked Chinese President Xi Jinping to aid the restructuring of the war-torn nation. During his visit Wang announced China will increase aid to help infrastructure projects, including the construction of school buildings in Kabul University, offering farm machinery and training classes to Afghan technicians. “The Chinese government encourages and supports capable Chinese enterprises to invest in Afghanistan to strengthen cooperation with the Afghanistan side in trade, energy and other fields,” said Wang. In 2007, Chinese mining companies announced the single biggest foreign investment in Afghanistan, a whopping $4 billion into developing a copper mine. Mineral reserves in the country, including copper, gold, iron ore and rare earths, are estimated to be worth $1 trillion. In a separate meeting with Rangin Dadfar Spanta, Karzai’s national security advisor, Wang stressed on security cooperation even as the Chinese government battles insurgency in the restive region of Xinjiang. China lauded Afghanistan’s efforts to crack down on the East Turkestan Islamic Movement and other terrorist forces. “China hopes both sides would continue strengthening such cooperation,” said Wang. Spanta said as a good neighbor of China, Afghanistan will keep its policy to cooperate with China to fight the “three evil forces, ” including the East Turkestan Islamic Movement. The US and its allies invaded Afghanistan on October 7, 2001 as part of Washington’s war on terror.